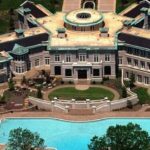 Maybach Music Group CEO and rapper Rick Ross will be calling boxer’s Evander Holyfield former 235-acre estate his new home after recently purchasing the 109-room mansion. 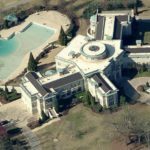 The home, which Holyfield lost in foreclosure, is stated to be one of the biggest single-family homes in Georgia. 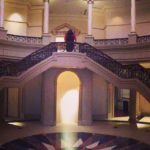 The elegant 50,000 sq ft mansion built in 1994 features 13 full and 8 half baths, 12 bedrooms, a dining room which can seat up to 100 people, a bowling alley, movie theater with a 135 seat capacity, a library, rec room, sun room, breakfast room, workshop, baseball field, tennis court, drive under basement garage, Olympic sized swimming pool (one of the largest private pools in the US), a 4000 sq ft second home, 7 stall barn, among other amenities. 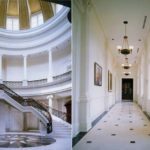 Artist Meek Mill somewhat confirm that the home is now home to Rick Ross, the Mississippi born William Roberts II, by posting a picture to his Instagram with the caption that read “new crib is unreal,” which shows Rick Ross standing on the top of the balcony of the rotunda staircase which has mahogany handrails.